Efficiency is the proof of correct type and structure – physical fitness and fitness for purpose. A dog built right will be able to function longer, suffer less wear and tear and be less prone to arthritis in old age. In that sense, soundness is a key factor in health and longevity. Harmonious, lithe, ground covering, slightly springy. Legs must be parallel in movement coming and going. That is what the (FCI) standard calls for. What a lovely word “lithe” meaning easy flexibility and grace. Harmony between front extension and rear drive. A free, effortless, effective, ground-covering stride with a certain degree of elasticity, caused by a momentary suspension between footfalls while the dog is gliding forward by momentum. Topline that remains straight and parallel to the ground. Free action at the elbows, which must not turn out or be tied in. Parallel hocks and a clean pair of heels going away, parallel legs and feet coming forward, forming a straight line from shoulder to foot, converging at speed towards the center of gravity. Uninterrupted, flowing motion and workmanlike gait, not stilted or lumbered in any way, the dog must neither drag its heels behind nor throw the front legs up like a hackney pony. So difficult to achieve on such a large breed shaped by human intervention instead of natural evolution and especially for totally square males… But it is attainable. Maximum length of stride comes from excellent articulation and movement of shoulder and upper arm, rotation of the shoulder blade (which does not happen when the shoulders are loaded – and the wrong exercise regime can cause this loading – overbuilt of muscle underneath the blade pushing it outwards – ruining an otherwise good dog and causing it to pin its front feet in) together with a long properly angled croup, a muscular thigh, a good turn of stifle and a short strong hock, which give a powerful thrust from the hindquarters, not a weak swing like a pendulum. But maximum length of stride does not mean overreaching: maximum length of stride means maximum as defined by efficiency. Economy of action, neither under nor over-stepping. No energy wasted, perfect synchronicity of footfall. The back must not be broken behind the withers nor should the croup be higher than the front, faults that belie a dog in two parts loosely joined together, that falls apart in the movement. Efficiency largely depends on high withers capable of carrying the weight of the Dane and on strong, slightly sloping pasterns. There is a saying that goes “he puts his feet down like ready money” – that describes very well a dog that pounds the ground with the front legs in short choppy steps due to poor balance between front and back assembly and poor muscle development. Dogs with vertical pasterns also move this way and suffer joint damage very soon. Other dogs compensate for lack of balance by crabbing, side-winding, pacing, moving wide, lifting the forepaws too high or overstepping under the body. In ergonomic movement the rear foot hits the ground exactly where the front foot left it, and only a fraction of a second later. Anything else is waste. There are a myriad faults in movement and they are all caused by anatomical imperfections, poor fitness, poor quality of tendons and ligaments or a combination of these. Naturally, well padded & knuckled feet and strong pasterns & hocks with the ability to absorb shocks are most important for good movement. 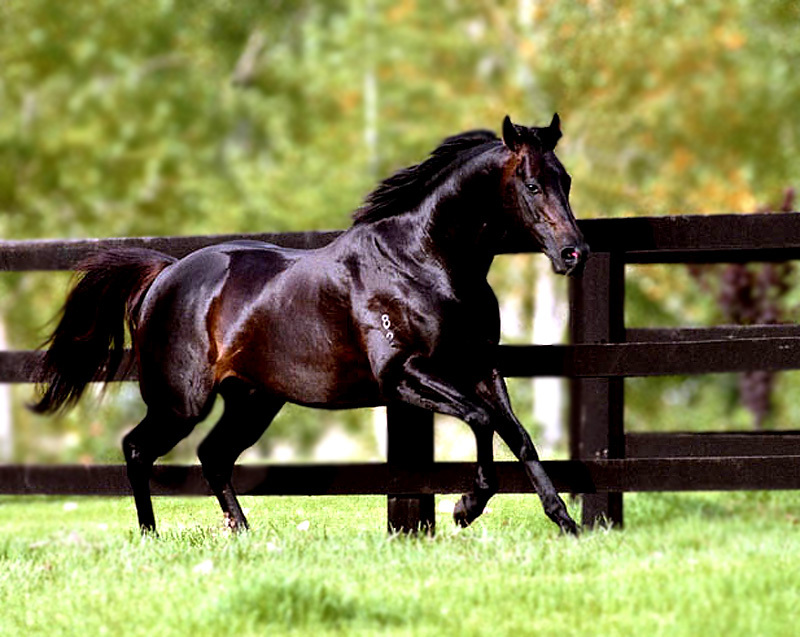 The ability to build muscle, the proper, smooth and flat muscle of the endurance galloper, as well as strength and elasticity of tendons and ligaments and joint lubrication are genetic. So the breeder must be able to recognize these and select for them. Now, to train your eye to see all this and interpret each cause and effect correctly, is the tricky bit and something that takes years. It’s particularly difficult to see and evaluate shoulders without extensive experience. Evaluating dogs live instead of watching videos in slow motion is the most difficult part of learning how to assess dogs and requires a good eye and knowledge of anatomy. At least we are lucky because a short-coated breed does not hide much. It is true that the eye grows accustomed to what it sees most often so when one’s dogs are very faulty, the person will have greater difficulty identifying the faults in others. The best way to learn is by observing excellence. Once you’ve seen a Dane that moves with this ideal, effortless action which makes the dog look as if it glides on air without touching the ground at the optimum speed of trot, with that elusive spring required by the standard and is so rare because it requires perfect cooperation between parts, it’s something you never forget and everything else will poke you in the eye. That harmony and effortlessness are as rare as a long dry day in Ireland. I was lucky to be the co-pilot of such a Great Dane and you can feel the harmony of the animal as you run next to it, you can feel it in your bones because you have to keep up and match it stride by stride. When you do see it, it’s poetry in motion. Years ago the AKC had issued a breed video of the Great Dane illustrated by one of my favorite dogs, the great ‘Fridge‘ (Am. Ch. Von Shrado’s I’m A Knock Out), who demonstrated that elusive perfection in Great Dane movement. The gorgeous brindle BISS Ch Alano’s Anastasia of Maitau (‘Ana‘) is also in it and I had to capture a still shot of hers from the video to show moving perfection in a Great Dane, she was airborne at this stage of the trot (the picture at the top). It was an excellent example caught on video. I am sure some people out there have it, it was a superb production under the direction of Eric Ringle. And if you don’t have it, it’s on youtube: the moving section and the complete video (in two parts). The head of a trotting Dane is held slightly higher than the line of the back, with the dog looking forward, the neck at an angle between 20 & 30 degrees from the horizontal. Trying to move a dog with the head strung up shortens its stride. Try to run while looking up and you’ll see what I mean ! To be able for this ideal movement, the Dane must be build exactly as the standard calls for: a large, fast, galloping hound for big game and, as the old standard called it, in built, somewhat between the mastiff and the greyhound – and of course the dog must also be physically fit. The Great Dane must be build along the lines of a thoroughbred horse, combining power & elegance. A front-heavy dog built like a draft horse can’t move like that – the dog will be pulling itself forward with its forequarters rather than driving from behind, or if it’s too short-coupled, will be overstepping under the body when moved at trot speed (a total waste of energy). A dog with loaded shoulders, too deep or relatively short-legged can’t move like that – the stride will be short. A dog with a horizontal pelvis, a steep croup, straight in front, or straight behind, or with over-angulated hindquarters can’t move like that – the stride again will be short or there will be no room to put the rear legs as they move forward, resulting in compensatory faults, crabbing, hackney gait, throwing the fore-pads high or moving wide. A dog that is too long or too short (taller that its height), or too sloping in topline, will again have a short stride, broken topline, lack of elasticity, or other compensatory faults. The spine is the chassis the transfers the kinetic energy from the hindquarters – it’s the single most important factor in efficient movement and you can’t have a faulty topline and a sound dog. Cyphotic (hunch-backed) dogs will bounce up and down, saddle-backs will pitter-patter going nowhere fast. They will struggle to cover ground because the force of the drive from the hindquarters is lost along the spine. The croup is part of the chassis of the dog and part of the topline so it has to be sound and well-angled at between 25 and 30 degrees off the horizontal to transfer the thrust from the hindquarters. A flat croup will tend to result in good rear extension but not much drive while a steep croup will limit the rear extension but that will have less bearing at the gallop. A short croup (pelvis) will hinder both actions due to reduced area of muscle. A dog that is considerably overbuilt (higher at the hips than at the withers), cannot drive effectively during the trot from the rear as energy is lost with the lateral roll, same as with too long hocks – which again affects more the trot than the gallop. Sometimes the movement looks effortless and there are no compensatory faults, but the action is not covering a lot of ground. This happens because the dog has inadequate but balanced angulation in front and rear, or poor musculature. In a big dog like the Dane this can be quite tricky to detect because even with short strides the Dane manages to cover more ground than a smaller or more short-legged dog. A clever handler will move a dog like that quite fast, resulting in a pleasing but deceiving picture. That is why we must stress the movement must be effortless but also effective. In other words, the maximum amount of ground covered with the minimum number of strides, at a speed optimal to the dog and determined by its size. Balance at the cost of efficiency is counterproductive. The ideal balance of true Dane type and construction has to be achieved in order to give the movement that is typical of the Dane and no other breed, because we must remember, the Dane is a large squarely proportioned dog with a level topline, so the movement that is excellent for a Rottweiler for instance, or an Alaskan Malamute, is quite different that the excellent movement of a Great Dane. A Great Dane properly built for its original function, i.e. an endurance galloping dog for hunting big game, is not the most efficient model for trotting. So we can’t expect a Dane to move like a GSD or a drover: the Dane should have a more open angle (not the mythological but unrealistic 90 degree angle – the FCI standard correctly calls for an angle ) in the front and more (but never excessive!) angulation in the rear, to go with the square proportions of the dog, otherwise he will crab or move with short steps, because he doesn’t have the length of body to put his legs under that the trotting breed has. Generic judgment favors generic movement and expects all dogs to move like American Cocker spaniels with flashy exaggerated action. The Dane should be able to switch gears according to between 100 & 110 degrees at shoulder joint) the terrain, as the dog in its original function had to cover long distances, conserving energy, switching gaits between trot, canter and gallop, flooring the throttle when the quarry was sighted. So the ideal Great Dane’s structure is a compensation to allow maximum efficiency & perfect timing under all these situations. It’s the most demanding structure biomechanically, far more demanding than the sprinter’s or the long distance trotter’s, because it’s far more complex. So how can you gauge this in the showring? You can’t. What you can do is look for a dog that moves as efficiently as its biomechanic model allows, not making compensatory faults of action, no wasted motion, in hard condition and without rolling, pitching, or twisting, remaining a unit, with perfect symmetry between sides, showing good coordination and footfall, holding his topline without bouncing it up and down, not falling at the forehand and with his head at the right height. The Dane is a sighthound essentially so when standing his head should be held high but naturally the head drops when the dog is running and you should be able to see this if the handler is not stringing the dog up. And if the hander is stringing the dog up, ask them to move again with a loose lead. Below is an example of optimum extension of the pure sighthound type dog on the trot; notice that shoulder-blade & foreleg form a straight line (demonstrating the blade rotation of the greyhound) and that all four feet are off the ground; naturally and normally the dog would have broken into canter or gallop to increase speed beyond this point but show dogs are trained to maintain this gait. This is a beautiful animal. 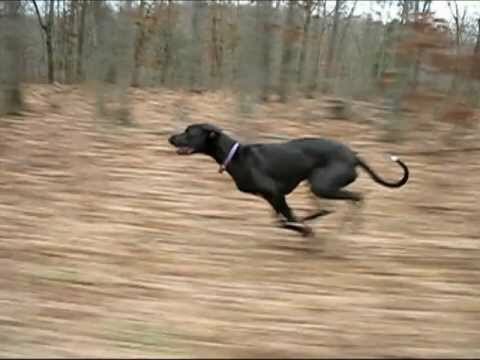 She is already at maximum efficiency for the trot; the limbs are fully extended but there’s no over-stepping; she is lifting the front pads horizontally off the ground because her front extension is not as much as her rear’s – it’s not a fault: that’s how a pure sighthound nodel adapted for maximum double-suspension galloping speed handles full speed trotting, especially a squarish example like this individual. Example of optimum extension on the trot of a molosser type. Less rotation of the shoulder blade, trotting very low to the ground without lifting the pads, low head carriage and balanced extension of the fore- and hind-limbs facilitated by a body that is slightly longer than tall. A powerful mover and excellent example of this breed. The Great Dane should fall between the two types. “Long easy, springy stride with no tossing or rolling of the body. The back line should move smoothly, parallel to the ground. The gait of the Great Dane should denote strength and power. The rear legs should have drive. The forelegs should track smoothly and straight. The Dane should track in two parallel lines. Next we will examine the anatomy required to produce efficient action in the Great Dane model.